Dictionary containing more than 3200 terms. PMP® Dictionary is a collection of more than 3200 terms that are used in project management. 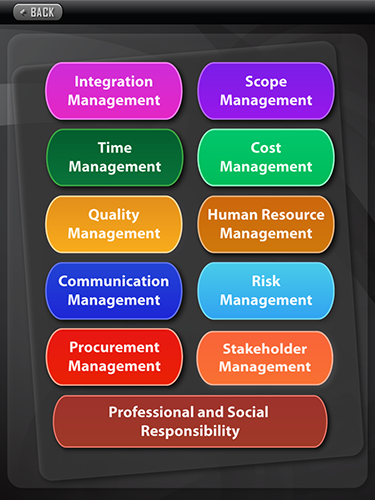 The ten knowledge areas with their processes followed by ITTO given. 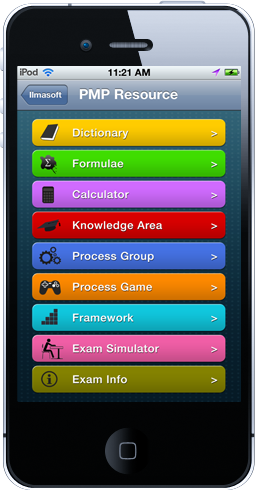 A total of eleven practice exams are embedded in the app. Each exam is tied to the module explained. Process Group chart relative to knowledge areas with practice questions. 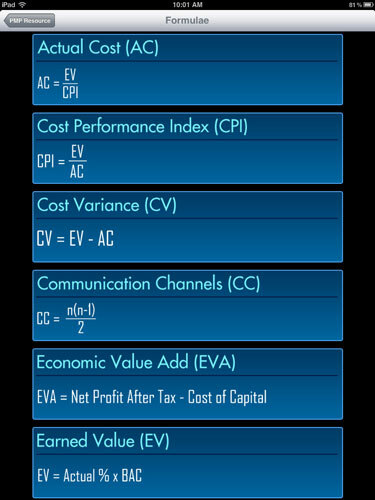 A separate header given for formulae that are used in project management. 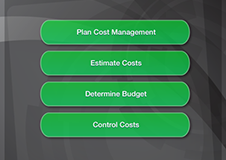 Project Management Calculator is a valuable tool added to this resource app. 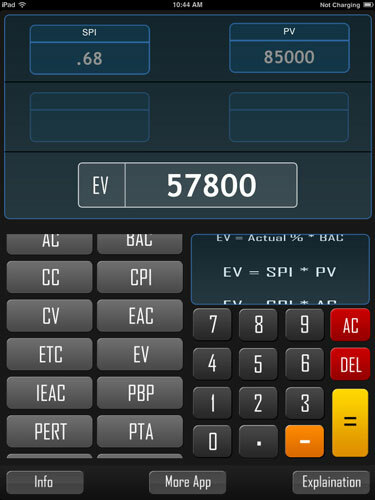 It can be used to remember formulae and their working relationship as well as on projects. Each formula when selected have the option to display details about it. Project Management Process Group Identification game is a unique way to make the user understand the relationship of the activities in the process group. Exam consists of 200 questions. Clock timed for 4 hours (240 min). Elapsed and Remaining time displays. 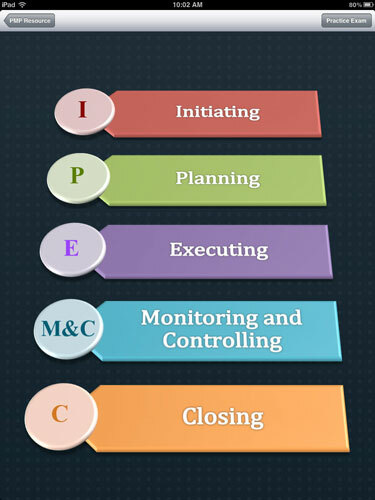 PMP® resource (app) holds a derivative license of PMBoK® guide from PMI Inc. USA. The new update comprises of comparison of PMBoK4 & PMBoK5. This Application is developed and approved for publishing under the derivative license from Project Management Institute, Inc. PMI®. The application has a unique style for teaching and testing Project management fundamentals to students seeking PMP® certification. 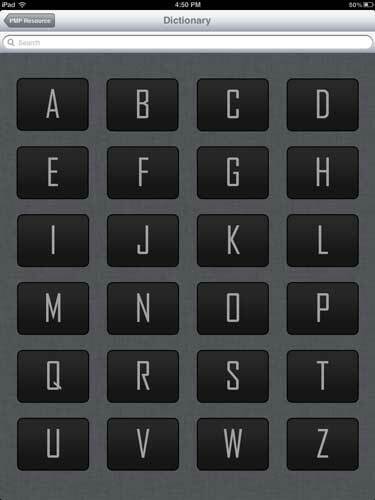 This is the best thing to have in your mobile portable device for utilizing dead times like travelling and during breaks. 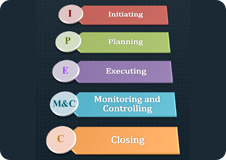 Everything related to PMP® certification is covered. 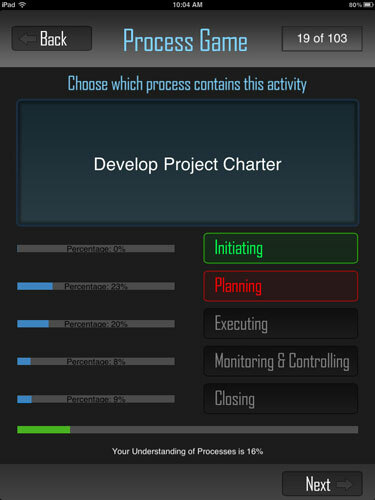 This app is a valuable learning tool for all, based on the PMI® project management guidelines and concepts, a valuable resource for project managers. An app designed to be owned by the greater society. Our commitment is to continuously update as a joint effort from us and you as a user by providing your feedback as well as suggestions for the update. Exam Consists of 200 questions. Clock timed for 4 hours(240 min). Elasped and Remaining time displayes. Questions can be marked for review. Exam timer can be paused. Explanation of given answers can be viewed. Result displayes at the end. A to Z project management terminologies explained so PM candidates and professionals can review them and clarify confusions easily on the GO. 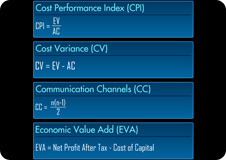 PMP® formulas are one of the main components of PMP® certification. It is very important to understand and remember these formulas for passing the exam as well be successful in practical field. Knowledge area in the form of exam. 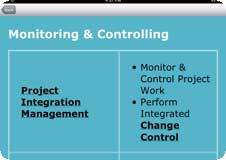 All the project management processes are defined with their respective ITTO's and includes a sample test that carries typical question related to the topic. All 5 process groups are listed along with which knowledge area these groups fall into. 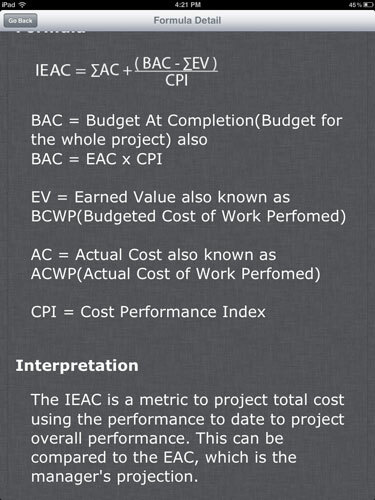 This is very important to understand and memorize from exam point of view. 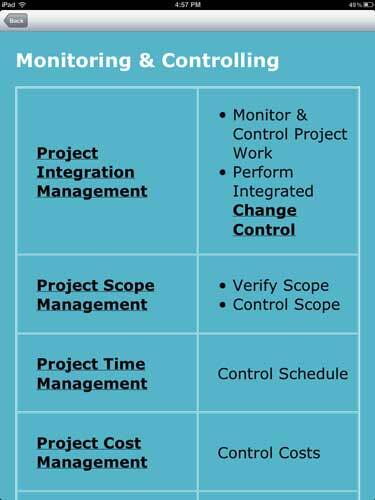 Each project management process is defined by the ITTO in detail. 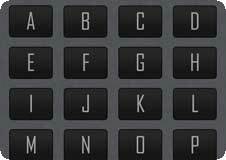 A quick view of the Input Tools & Techniques and Output with color combinations helps to study and remember, and provides important terms link to the dictionary. Process game challenges the candidate to test his/her knowledge about process groups and activities related to it. 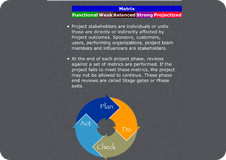 Details about the PMP® framework. "yes I did it !!! - Finally got my certification :-) thanks to PMP resource as this was one big tool in my success. My advise don't see here and there, just go for this and pass the exam." "Wish me good luck - Finally I decided to go for the certification, wish me good luck. This app I bought it last year is still as good as new because of the updates. Thanks for this app as I am able to study during my dead times. The tips are absolutely helpful as per my colleague who got recently PMP certified." "Great Result - I love this application. 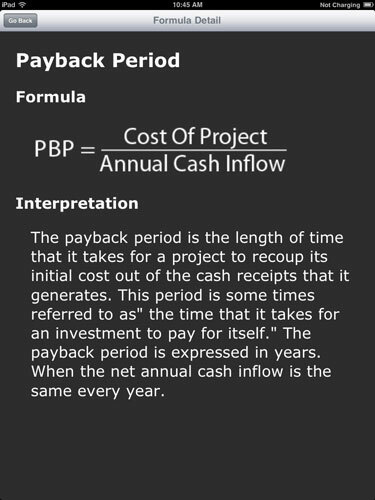 I needed a tool that would allow me to cram for the PMP exam in less than a week. I bought Rita's book and this application. I read the first couple chapters of the book and noticed it was telling me ways to memorize all of the process groups and knowledge areas. Well, that is exactly what this application does and more. So I stopped with the book completely, and studied daily on PMP Exam Resource, Rise Up-my iPad never left my side. The mini exams and process group game was incredible. It helped me to memorize the individual activities in a single day of cramming. The formula section is very nice as well, although I wish their would have been a game to memorize them like the process groups and knowledge areas. The day before the test I took the practice exam, and the next day when I took the test it was very similar. The cool part about the practice exams is that on each question you can have them explain the answers. So, taking the practice exam not only prepared me for the test, but also filled a lot of knowledge gaps. I studied using this tool for five days and I pass the test on the sixth day. Results may vary, but do yourself a favor and buy this now. You will not regret it. 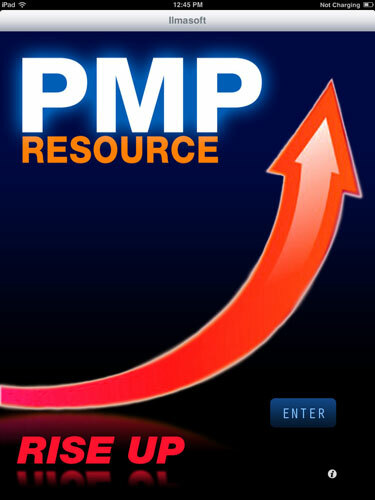 Thank you to the PMP Exam Resource, Rise Up team, you really did a nice job here." "Amazing help! 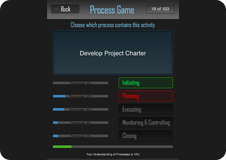 - This app has helped me no end in achieving my PMP certification. 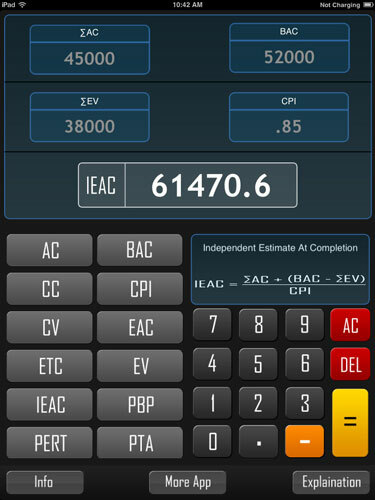 The app has a great design that makes it easy to use and navigate around. The exam simulator is perfect. I highly recommend this!" 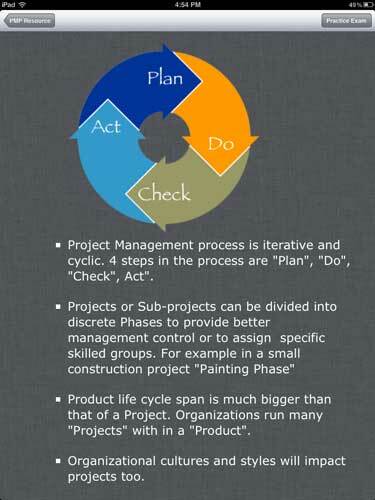 "better project management - My work colleague recommended this app and got me interested to download it on my iPhone. I like the flash card group id game as its a very visual aid to understand the use of activities in the process group. Both thumbs up from me." "PMP. - This will help you ASSIST ANY BODY STUDYING PMP.IT'S helped me 40% more than Seek, Skill Soft......hook it up and go for it"
"I like my iPad because of this app - This is one application full of PMP resources.... I like the way it is designed, no need to have separate flash cards or exam modules or cheat sheets. Learning on the way..."
"Surely far more worth then what is costs. 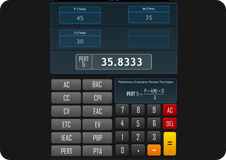 If serious about PMP I recommend go for this app and don't waste time/money else where." "Yes this is a good source for preparing PMP exam, It helped me alot for reviewing the process group and all knowledge area's on the go. 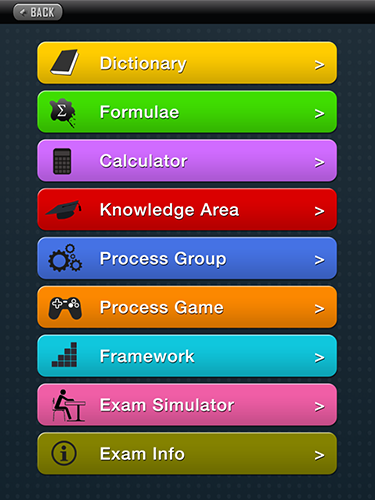 Other tools like Calculator, PMP terms dictionary and glossary are fantastic, not found in any other apps. 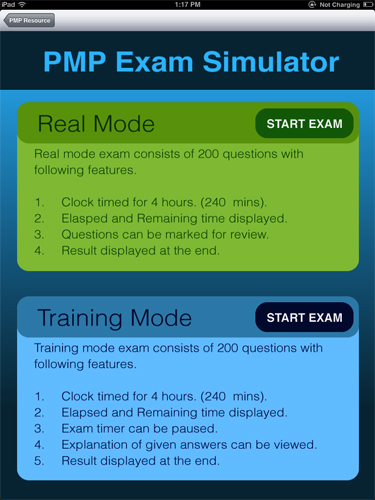 Like the idea of providing exam info for people who are just exploring about PMP certification"
"I'm using this app to help me study and prepare for the PMP exam. it is a great resource and reference tool to have. User will love the interface and find the content extremely useful. 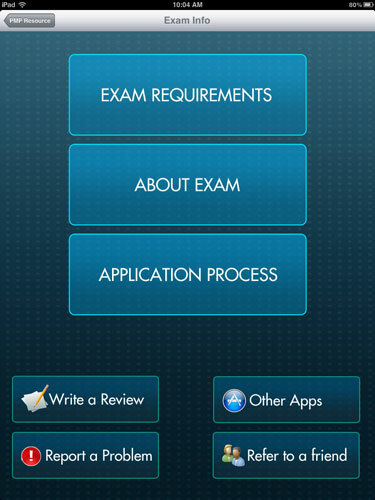 If you are studing for the PMP exam make sure you utilize this application as a reliable aid." 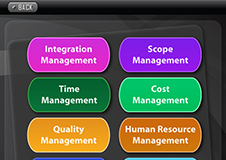 "This is one application full of PMP resources... I like the way it is designed, no need to have separate flash card or exam modules or cheat sheets. 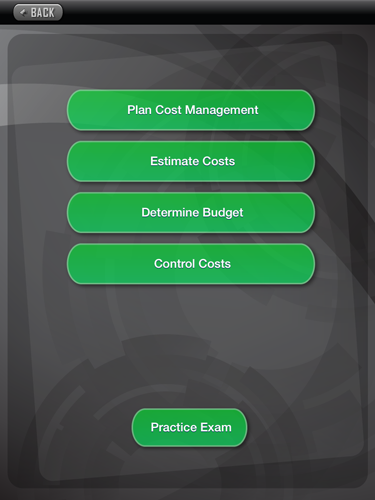 Learning on the way"
"This app is the best regarding PMP. I have downloaded a couple and read about the others, but i found this to be the best amoung all..."
PMP Resource® Copyright, All rights are reserved.